My Cracksilk Haze addiction is well documented on this blog. I guess I have just found out why recovering addicts are not supposed to hang around with people with similar addictions…. Jenny, one of the Guilty Knitters, has been doing some serious destashing. She generously offered me her unwanted Kidsilk Haze, knowing I would give it a good home. 😀 Thank you Jenny! 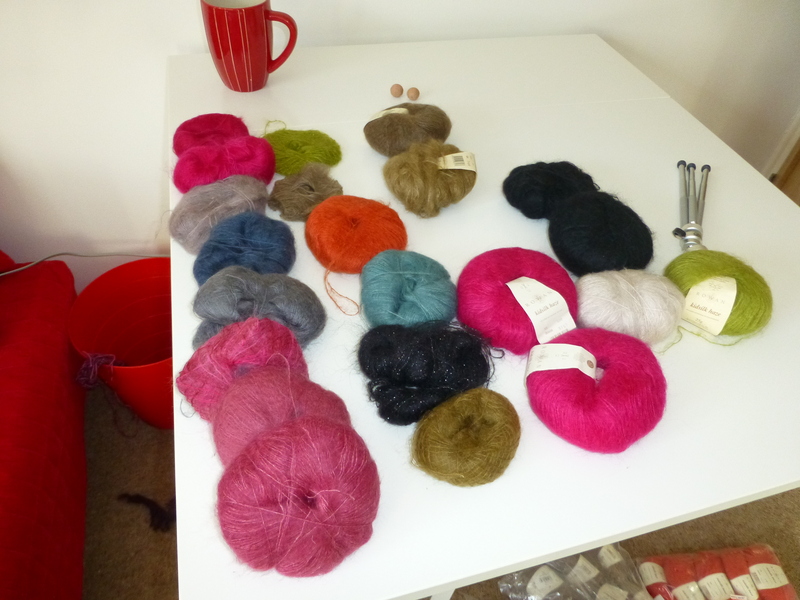 I have spent most of today sorting out and checking my Kidsilk stash – There were quite a few odd balls that hadn’t been added to Ravelry (all the large amounts were in there) and a few clear blunders. Want to see what a drawer full of KSH looks like all over the floor? It was at this point I decided that KSH, if left alone in a dark cupboard will in fact breed like Star Trek tribbles! …I’m not mad keen on another fuzzy jumper that thick and warm. The Kidsilk Aura has to go. a whopping 222 balls of Kidsilk Haze, Spray, Night and Eclipse!! I really need to knit some of this or start eating it…. Oh MY! That’s a LOT more than I was expecting. I definitely think you need to find lots of BIG projects to use that on, or just add a strand to whatever yarn you are using in every project to make everything fuzzy and warm. That IS impressive!! I think that Rowan should name a colourway after you to honour your brand loyalty!! I understand your passion….I’m not a knitter, but I have just finished a l-o-n-g lace project with Kidsilk Haze…isn’t it lovely to knit with?